Prosecutor Rachel Mitchell, as the Senate Judiciary Committee’s outside counsel, quizzed Christine Blasey Ford Thursday on how she got home from her alleged early 1980s encounter with Judge Brett Kavanaugh. “I do not remember, other than that I did not drive home,” Ford told the committee. How Ford got home after she claims to have fled the high school gathering, where, she alleges, a 17-year-old Brett Kavanaugh groped her before she managed to escape, remains an unexplained area of Ford’s accusation. She claims to have walked out of the bathroom where she hid after escaping from Kavanaugh and friend Mark Judge’s clutches, rushing out to the street upon hearing the pair go back downstairs to a living room from the bedroom where they assaulted her. 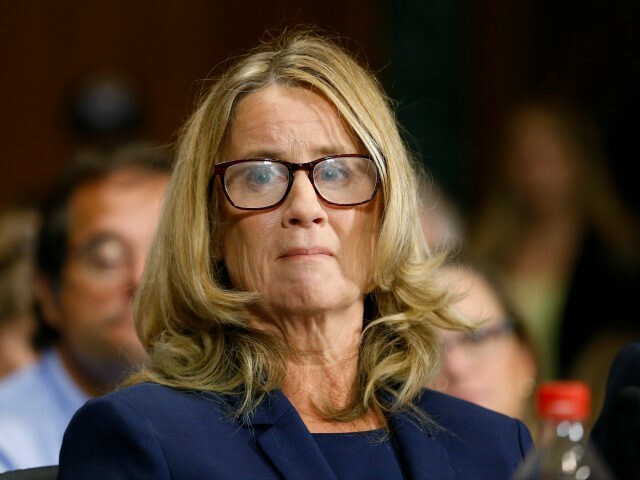 Ford has never offered an explanation of how she, then 15 years old, and who, by her own reckoning, could not drive, made it miles back to her home. Mitchell began her line of questioning about her return home by trying to approximate the location of the party, which has also never been definitively established in Ford’s allegations. Using a map, Mitchell showed that if the party were within one mile of the country club from which Ford claimed she came before the party, it would be between 6.2 and 8.2 miles from her home. Ford confirmed that this would have been the driving distance. “Would it be fair to say that somebody drove you somewhere, either to the party or home from the party,” Mitchell asked, and Ford responded that it was. Next, Mitchell inquired if anyone could corroborate this aspect of Ford’s story by saying he/she was the driver. “Has anyone come forward to say to you, ‘Hey, remember I was the one who drove you home? '” Mitchell asked. Ford admitted no one had.